Building and maintaining successful relationships with business partners external to your organization can make a difference. When the external business partner plays a crucial role in your business success, what is the path to find the right match and ensure a fruitful long-lasting relationship? The short answer, as with any relationship, is that it takes something to get something. So, what does it take? And what to expect to get? 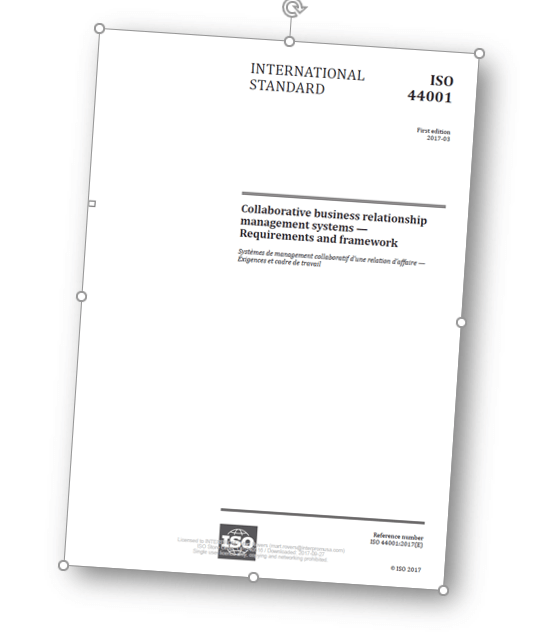 This article will provide insight in ISO 44001, an international standard for business relationship management, which has laid out what it takes and what to get. ISO 44001 is the international norm for Business Relationship Management (BRM), for organizations seeking guidance in managing external (third-party) business relationships more effectively and with higher success rates and longer longevity. ISO 44001 was released in 2017, underlining yet again the importance for organizations to develop, nurture and improve the capability, profession and discipline of the management of business relationships whether within an organization or between organizations. Both concepts lay the groundwork and provide the answer to what it takes to establish successful external business partnerships. Context of the Organization: what is the value the organization is seeking from an external business partnership? Leadership: what role does top management play in ensuring the external business partnership is successful? Planning: what are the preparations to ensure a smooth start of the external business partnership? Support: what is the support system that needs to be put in place for a successful external business partnership? Operation: what does the lifecycle of successful external business partnership look like? Performance Evaluation: how to measure the success of the external business partnership? Improvement: How to determine and to manage opportunities for improvement? Each component is a building block of a solid foundation that enables successful business partnerships. For collaboration between organizations to function effectively, the organization seeking a (strategic external) business partner must identify and manage numerous linked activities. ISO 44001 defines these linked activities and their parameters. Furthermore, ISO 44001 promotes the coordinated integration and implementation of the business relationship management processes to provide the ongoing control, greater efficiency and opportunities for continual improvement of the collaboration between the parties. Each stage sets clear goals, references the activities to be taken and lists the deliverables and outcomes to be achieved. By executing the activities of each stage, you are setting up your business partnership for success. Essentially, ISO 44001 is providing you with an execution checklist. This list can also be used as a relationship quality assessment to help determining improvements of any existing business partnership. Whether you are seeking compliance with or even ISO 44001 certification or are simply looking for straightforward guidance on how to establish and improve business partnerships, the standard is just one more tool to consider for your business relationship management toolkit. So, purchasing a copy of ISO 44001 standard at www.iso.org is the obvious first next step. Considering an ISO 44001 Fundamentals course is an another obvious one. More involved are steps that will impact the way you are doing business with your external partners by applying the guidance that is provided by the standard. For example, few business partnerships discuss at planned intervals, any risks that have surfaced within both organizations. Or, few contracts require frequent opportunities to be discussed to either enhance the existent service or product offering or expand on it based on (potential) needs. What has become a more accepted topic of discussion in business partnerships is how the business processes of the parties involved interface with each other and the quality levels of these integrations. These are just few examples the ISO 44001 standard requires to establish successful external business partnerships. Contact us to chat about how your organization could benefit from ISO 44001. It’s a worthwhile consideration and we would greatly appreciate the opportunity to answer all your questions.